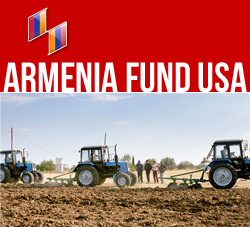 Protecting your privacy is of utmost importance to Armenia Fund USA. Our website is a secure environment for all of our visitors. This note is intended to inform you of our policy concerning your privacy. If you make a donation to Armenia Fund USA, register for a newsletter, provide us with feedback, volunteer or apply for a job, we ask for personal data that is personally identifiable and is used to i) process your donations, ii) send you tax-deductible receipts, iii) keep you informed and up-to-date about our activities and projects, iv) contact you about events and fundraising activities, v) undertake statistical analysis and take other similar actions in support of our mission. Donations on our website are processed through Network for Good, a leading Internet charitable resource aimed at connecting people to charities via the Internet. The privacy of personal information you share with us, such as name, address, telephone number(s), e-mail address and credit card information, is secured through the Privacy and Security policy Privacy and Security policy of Network For Good, which uses industry-leading Secure Sockets Layer (SSL) technology to make your transactions as secure as possible. We do not knowingly collect identifiable personal data from children under the age of 13 without the consent of their parents. It is Armenia Fund USA’s policy not to share, trade, exchange, rent or sell any personally identifiable information to any third party without prior consent. We may, however, share data with our partners and/or third party financial institutions to process your requests/donations and to better serve our mission. We may also use personally non-identifiable information for statistical purposes to encourage fundraising activities. Your personal information will not be used to pursue goals other than as set forth in the mission statement of Armenia Fund USA. We take serious and reasonable measures to protect your privacy, but because no internet security system is completely impenetrable, we assume no responsibility for the utmost security of information.